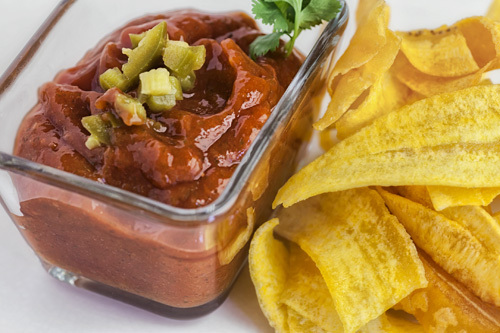 Although the ketchup undoubtedly is one of the most popular and most used salsas in almost all the cuisines of the world, there can be occasions in which we would like to give it a spin and taste different versions of this famous salsa. So this recipe of jalapeno ketchup is a good option to break the routine. Imagine that the original flavor of the ketchup is mixed with the strong and penetrating flavor of the jalapeno pepper . Besides vinegar and coriander is used to balance the flavors and in this way a very different ketchup is obtained, that you have to experience. This Mexican variation of the ketchup can be used in the same way in which the regular ketchup is used. Then you know that it can be used to put to snacks, appetizers , sandwiches, French fries, hot dogs, etc. The preparation of this recipe is for beginners. In this recipe the ketchup won’t be prepared because is difficult to make and nowadays is very easy to get – any type of ketchup can be used in the recipe. To make the recipe pickled jalapeno peppers are needed, that can be bought canned. In less that 5 minutes the ketchup will be ready. With this recipe 1½ cups of jalapeno ketchup will be obtained. 2 tablespoons of the Vinegar of the pickled jalapeno pepper. Variation: The ketchup can also be prepared with chipotle pepper. Did you like the Ketchup? These jalapeno peppers are perfect for the recipe. Give more flavor to the ketchup by using organic pepper. Put the ketchup in these bottles.